Open a Chase Plus Savings Account with a deposit of $25,000 or more in new money within 10 business days to receive the $300 Bonus Promotion. 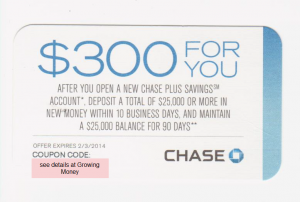 Chase Account holders receive these coupons through the mail, once the coupon is on hand you can use this unique coupon code to receive the $300 Bonus Promotion. To receive access to this unique code, Chase Holders are selling them online via Ebay. It may seem odd to purchase a coupon online but these coupons are not offered to everyone, but once in hand you are receiving a $300 in Bonus Promotions. Maintain at least a $25,000 balance for 90 days from the date of deposit. Wide range of alerts that help you stay in control of your finances and keep your accounts safe. With Account Alerts we’ll notify you via text or email if your account has activity that you told us you want to know about. Our Chase ATM and branch network is big, and is growing. And if you’re somewhere unfamiliar you can find the nearest branch or ATM using the Chase Mobile App on your smartphone. Chase Savings and Chase Plus Savings accounts have the security of FDIC insurance, up to the maximum amount allowed by law. The base coverage amount is $250,000 for each depositor for all combined deposits in the same bank. Visit Chase for their all terms and conditions. Sign up for the Chase Plus Savings Account $300 Bonus Promotion. See our full list of Bank Promotions for all bank deals.